Today, February 21, 2016, Atocha turns one year old which means she is officially adoptable! Head over to the Membership & Donations section of the Dolphin Research Center website to adopt this adorable little girl. Thank you for supporting the DRC mission and allowing us to give our animal family the best care possible! Several years ago, Sea Rescue featured a story on our rescued family member, Jax. Now, it's Louie's turn to share his story. Louie was the first live dolphin to be rescued off the coast of Louisiana in September of 2010. He was covered in oil and had multiple injuries when rescued by the Louisiana Marine Mammal Rescue team. 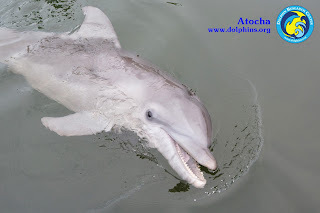 With only a 5% chance of survival he beat the odds and is now thriving at Dolphin Research Center. The episode of Sea Rescue will air February 20, 2016 on ABC. Please check your local listings for times.